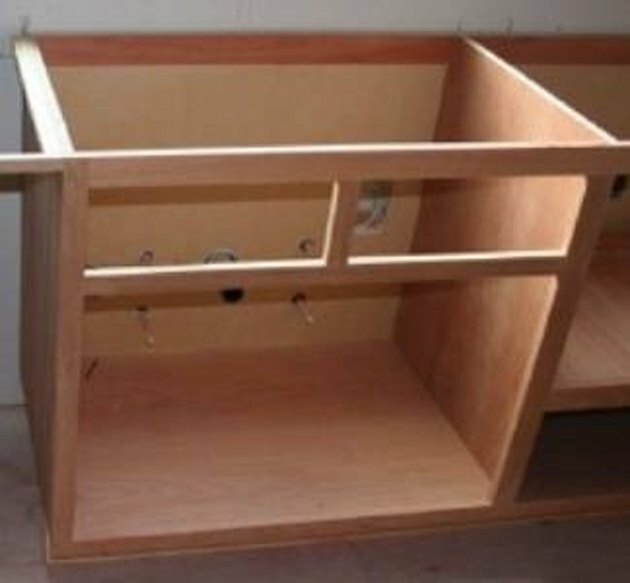 Of all the cabinets in the kitchen to build, the kitchen sink base cabinet is among the easiest. It consists of two end panels, a bottom shelf, a back and a front with doors. 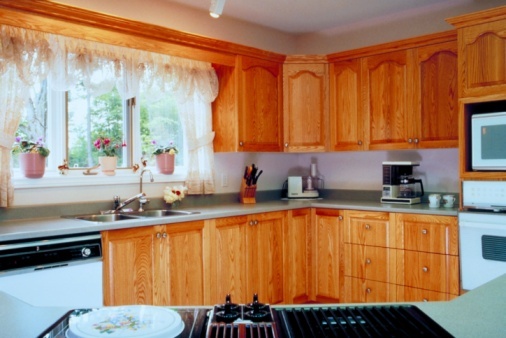 If you are familiar with power tools all you will need besides that knowledge is the basics of building cabinets. Place the two end panels on a table with the long edges touching. Measure up 4½-inches from the bottom where the two end panels meet, and make a mark. Place the carpenter's square on the mark and draw a line out to the long edges that were touching. Place the measuring tape on the edges that were touching and make a mark at 3¼ inches. Place the carpenter's square on that mark and draw a line up to the 4½-inch line. This gives you the cutout for the toe board. Cut this notch out with the jigsaw. Repeat this process on the other end panel as well. Place the two pieces of 4½-by-19-inch plywood on the end panels where you cut the block out. They will sit ¾ inch back from the edge where the notch is and will be flush with the back of the end panel. Secure them with the finish nails. Repeat this for the other end panel. These are the cleats that the bottom shelf will rest on. Place the 34-by-23-by-¾-inch plywood (shelf) on the table. Drill several pilot holes 3/8-inch from the ends of the shelf. Stand one of the end panels on its back edge, and apply glue to the top of the cleat. Place the 34-inch shelf on the cleat, and secure it with the finish nails. Repeat this process on the other end panel. Apply glue to the front edge of the cleat and place one of the 4½-by-34-inch plywood pieces on the front of the cleats. Secure it with the finish nails. Next, apply glue to the edges of the other 4½-by-34-inch piece of plywood at the top and the back of the cabinet. Secure it with the finish nails. This is the back brace and allows for securing the cabinet to the wall. Place three of the 2-by-32-inch pieces of plywood on the table side by side. Measure from one end and mark the center. Next, measure 1 inch in both directions from the center mark and make a mark. Place the carpenter's square on these two marks and draw a line across all three pieces of wood. Place the other 2-by-32-inch pieces of plywood on the table perpendicular to the ones from Step 1. Place one of them at the top of another one to form an "L."
Secure these two pieces together with the corrugated fasteners. Next, place the 2-by-4½-inch plywood in the corner that you created. Make sure the grain of the 4½-inch piece and the grain of the 32-inch piece are running in the same direction. Place another 32-inch piece of plywood against the bottom side of the 4½-inch piece of plywood. Secure it with the corrugated fasteners. Repeat this process for the other 32-inch piece of plywood. Next, place the last 32-inch piece of plywood on the other end and secure it with the corrugated fasteners. Place the 21-inch piece of plywood on the center marks that you drew and secure it with the corrugated fasteners. Do the same with the 4½-inch piece of plywood. Apply glue on the front edges of the two end panels and the bottom shelf. Place the face frame on the front of the cabinet. It will hang over the end panels ¼ inch on both sides. Secure it with the finish nails. Set the nails with the nail set, and fill the holes with wood putty before sanding. Measure each opening in the face frame and add 1 inch to the dimensions. For example, one of the openings measures 15 by 21 inches. By adding an inch to both measurements, the door size will be 16 by 22 inches.